So, Miramar. That far and distant mall out on the outskirts of Taipei. Finally took the trip out to the Miramar entertainment park at the Jiannan MRT exit on the Neihu line. They call it a park, but it's really just a big fancy mall with nothing much around it. Perhaps it'll develop in the future as Taipei city expands. The mall is really nice. Upscale and well designed. Much of the mall have upscale brands ranging from LV to expensive Taiwanese fashion brands. There were some discounted and cheaper stuff on the top floor. Whats really cool is the Ferris wheel on the top floor. They have both normal cabins and glass cabins. 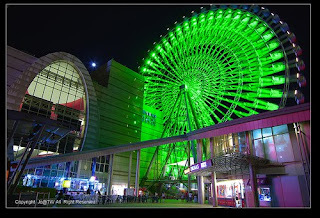 That night, there were lines of couples waiting to go on the Ferris wheel. I think the price was around $150. Again, it's slightly discounted with a student ID :). Definitely a must ride if your with your significant other here at night. There's also some nice, but limited choices for restaurants at the Miramar. Fear not, there's the Five Dimes restaurant I blogged about previously nearby. Overall, nice place, but not that "special".